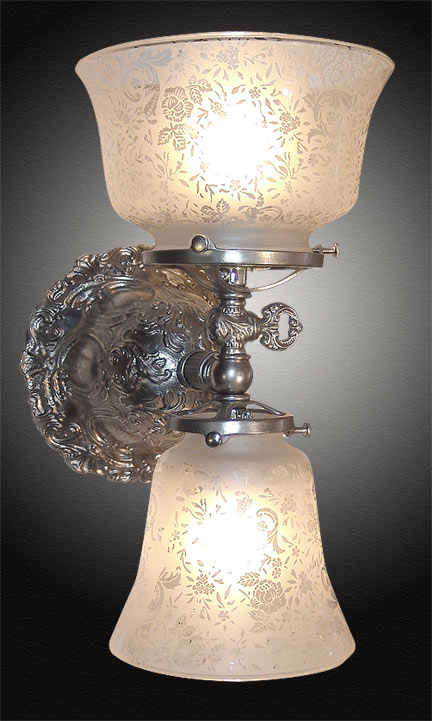 This French Gaslight is shown in Hand Styled Antique Pewter. Works best in pairs. Place it on either side of your vanity mirror or fireplace, or even beside your bed. An excellent foyer, closet or library light as well. Notice the stunning detail of all the solid cast brass parts. The addition of the faux gas key adds realism here. Shown in Hand Antiqued Pewter. Available in different Metal Finishes, different Glass, Back Plate, multiple arms and many other Custom Options.